Founded in 2013, Up Your Marketing is a company designed to help small businesses and organizations that may not have the resources or capacity to develop and maintain their own digital marketing. Kim Green, company founder, discovered her passion in digital marketing and the need for a service to help others who didn't have the capacity or capability to fully market a company or organization. With the internet growing rapidly, our founder feels that it is vital for all businesses and organizations have a strong online presence. Green holds an MBA in Management Information Systems from Troy University and a Bachelor of Business Administration with a focus in Marketing and Communications from Roanoke College. She is a member of Alpha Kappa Psi business organization and a sister of the Chi Omega fraternity. As a member of the board for the Hampton Roads Alumni Chapter (HRAC) of Alpha Kappa Psi, she has served as Social Events Chair and VP of Marketing. Kim's vision is to utilize her education and industry experience to help others gain insight into the world of online marketing. 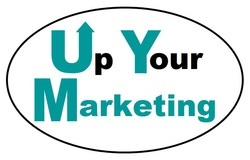 In short, the goal of Up Your Marketing, LLC is to help you to "Up Your Marketing."